Whether the Fed raises rates in December or early in 2016, many market strategists believe higher interest rates will be a reality very soon. A few of our recent articles mentioned our belief that the Fed missed the opportunity to raise rates twelve or eighteen months ago and a rate rise now will be implemented simply in order to provide the Fed with a cushion in the event additional stimulus were needed. Certainly the Fed has used other extraordinary means in an effort to stimulate the economy other than rate adjustments over the last few years. Nonetheless, the anticipated change in Fed policy to one where rates begin to move higher can have short term negative consequences for bond investors as we have written recently. All bonds will not react the same as rates are increased though. 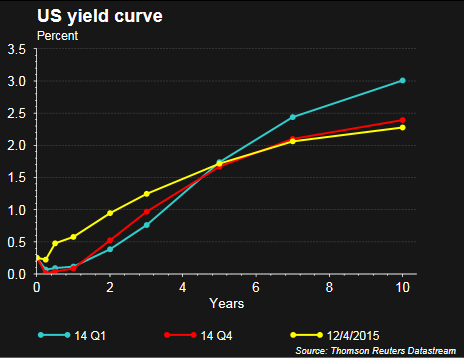 Logically if would seem the largest negative impact will be felt at the long end of the yield curve; however, the below chart compares the yield curve shifts over the last several years. What is occurring is longer rates are actually declining with rates on the short end, under five years, increasing. In other words, the curve is flattening with the twist occurring around the five year maturity range resulting in poorer total return for shorter maturity bonds than longer ones. Certainly rising rates can have an impact on long rates; however, another key variable is the level of inflation. What the economy has not seen during this recovery is a move to higher inflation. On the contrary, with the contraction in energy and commodity prices, along with a stronger U.S. Dollar, inflation has remained near zero as can be seen with the red line in the below chart. 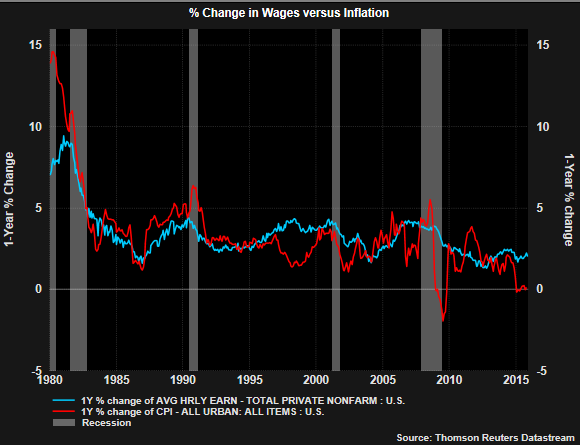 A potential catalyst to increased inflation is the fact consumer wage growth has been accelerating over the past three years despite what gets reported in the media. Since the consumer accounts for about 70% of economic activity in the U.S., higher wages can result in more buying pressure and thus the potential for higher selling prices on goods and services. Additionally, consumers are getting an indirect boost in their income as a result of the contraction in energy prices. Consumers are paying less for gasoline and utilities, leaving more income available to be spent on discretionary purchases. In addition to a strong U.S. Dollar, the increased efficiency being created by the internet and cloud via growth in e-commerce seems to be keeping a lid on price inflation. The end result near term is the worst performing segment of the bond market in terms of maturity may be on short term bonds versus the long term ones.